PINK FLOYD: DARK SIDE OF THE MOON: 1973: 5 STARS OUT OF 5 STARS: Pink Floyd’s 8th studio album is one of the most famous albums ever released. I am not a huge fan by any means and my dislike for progressive rock has been stated before- but I don’t mind a little Pink Floyd now and then. I was thinking as I listened to this why do I sorta like Pink Floyd when I detest other progressive rock? I think a large part of the reason is simply they are clearly superior to all other prog acts but I think it is also the vocals- David Gilmour and Roger Waters sound normal. STEVE EARLE AND THE DEL MCCOURY BAND: THE MOUNTAIN: 1999: 5 STARS OUT OF 5 STARS: After a couple rock oriented albums- an album with bluegrass great Del McCoury and his band. Outstanding album- Steve at this point couldn’t miss. The tour didn’t go as well with Del objecting to Steve swearing. “There is no swearing in bluegrass” apparently. This is a tour that I missed- don’t think they came anywhere close. also listened to this past Sunday’s Celtic Crush with host Larry Kirwan on The Loft. Pink Floyd does have some pop sense about them as far as catchy songs. Unlike…say Uriah Heep. I have to be in a mood to listen to them. It would be a straight 5* album for me, but the rather boring ‘On The Run’ which brings the rating down to 95.6 on “Chris’ unscientific rating algorithm”. Still my second highest rated album though. Ok. I play DSotM once a year and tonight was the night. 5* for every song bar ‘On the Run’. Strangely I find it difficult to differentiate Waters’ and Gilmour’s voice – I thought Dogs (from Animals) was sung by the same guy throughout. The Australian Pink Floyd Experience do good PF covers and have quite funny antipodean additions, such as ‘Tie Me Kangaroo Down…’ being incorporated into The Wall. 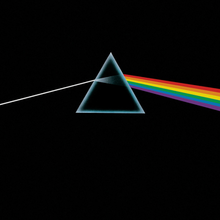 Dark Side of the Moon, this has to be one of the most listened-to albums of all time. Used to own the LP. What is the definition of progressive rock? Is this where the whole album is a concept? I never listen to just one song on this album. It’s a complete set. About Steve Earle: will borrow this from hoopla. Love the album cover!